"This cornbread is so delicious and moist, you'll find yourself making more!" Preheat oven to 400 degrees F (200 degrees C). Lightly grease a 9x9 inch baking pan. Mix egg, milk and oil together. In a separate bowl, stir together flour, sugar, baking powder, salt, cornmeal and potato flakes. Stir egg mixture into flour mixture just until combined. Pour batter into prepared pan. Bake in preheated oven for 20 minutes, until a toothpick inserted into center of pan comes out clean. See how to make sweet, golden-delicious cornbread. A quick and easy recipie. I would like more a corn taste and use 2x the amount of sugar. Unfortunately, I found this recipie, not very good. I found it dry, as most cornbreads. Very quick and tasty. I sprinkle an extra teaspoon of sugar on top before baking for that sweet taste. UFF, what can I say... it was quite moist but not sweet. I would have liked it with more cornmeal flavor too. 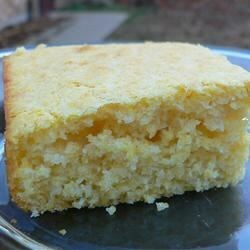 This has to be the best cornbread I've had! Thank goodness I ran out of Jiffy mix. Maybe next time I will add a little more sugar, but other than that it was amazing!